As a family tree researcher myself, I have taken great pleasure in your genealogy mysteries. Esme and Sophreena and their friends are a delight and I especially like the psychic story line. Recently I’ve been examining my family photographs and found the small group of people in front of a house photo included my husband’s grandmother as a young woman with her first three children. Your 30x magnifier would certainly be a godsend. 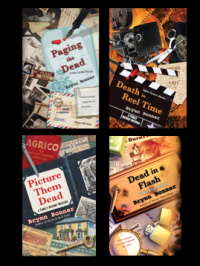 I’ve pre-ordered Dead in a Flash and am so looking forward to its release. Thank you for a wonderful series. Would love to win this package! The series sounds amazing, and I am a huge genealogist…everyone in the family turns to me for answers to the family tree questions. The magnifier would be a huge help to these aging eyes! Love genealogy mysteries and have not come acrosscthIs series, so i would certainly enjoy this package. I’d LOVE to win! Please throw my name in the hat! I am looking for a new series. I would love to try this one. Our friend Diane Chamberlain referred us. I, too, am looking for a new series and would love to start this one. Thanks for the opportunity to win a fun package!! Would love to win this, I LOVE to read! Margaret Maron shared the link! If Margaret Maron says you’re great, that’s all the recommendation I need. Especially since I’m an avid family historian. What a cool giveaway, your first two books and a magnifier loupe. Something I can use more and more these days, lol! I would love to be your winner! Thank you, and congrats on your new book. Thank you so much for the chance to win. The genealogy aspect of the mysteries sounds great, and the magnifier is lovely. Looking forward to reading your books! If Margaret Maron says you are great, then I cannot wait!!!! I’m a family historian, but haven’t had the pleasure of reading your books. They do sound right up my alley, so I’m keeping my fingers crossed I’ll win the package. Thanks for the opportunity. Now that my parents are gone, it is much harder to do family research. I’ve found several cousins on facebook and am finding out about their families. As for reading, it is like breathing. If Margaret Maron recommends these books, I will definitely read them. I love her books. Thanks for this suggestion! Congrats on the upcoming release. This looks very interesting. Thanks for the chance. Such a cool giveaway! Would love this! I would love to win these items and discover a new author to me. This sounds like a great series. Thanks for a chance to win a copy and other great items. I love mysteries and family history! What a great combination for a book series. I look forward to reading these books! Yes please, I would love to win. As a lover of mysteries, genealogy and family stories and southern eccentrics, I would love love to have the opportunity to begin reading your series. Thanks t Margaret Maron for her “good read” recc. I’ve been researching my family tree for years; that and reading are my two favorite hobbies. There are very few genealogy mysteries, so I would love to read a new one! Followed Margaret Maron’s link to your page. You sound interesting! I’d love to win your Giveaway – especially since I’ve traced one branch of my family tree all the way to the 1400s, and found relatives who fought in the Revolutionary War, the War of 1812, and family members on both sides of the the Late Unpleasantness. As both a lover of mystery and family history I’m excited about reading your books. I’ve been working on my own family history for over 30 years and have needed to be somewhat of a detective in digging out the details. I’d really love to be the lucky winner of your giveaway. I am the family historian in my family and I would love to read your books as I am also an avid reader. Here’s hoping I am that lucky. I just found you via Margaret Maron. I’d love to receive this give-away. Found you from Margaret Maron’s post – so happy to find a new series I’ll enjoy. Would love to receive the books. Any recommendation by Margaret Maron must be a good one! Please entry me in the drawing. Thanks. Oh yes please! Thanks for the chance! Love mysteries and just started dabbling in genealogy. Sounds like a double winner! Hope I win. I learned about you from Margaret Maron’s Facebook post today, and am so happy I did. I love genealogy research and mysteries! I found some fascinating things in my family tree – and I love mysteries. Sounds like this would be exciting to win this. I look forward to reading the books. Please enter me in the giveaway. I haven’t read any of your work and always looking for a good series and author. Sounds amazing! Would love to win. I would love to be entered in your giveaway. Thanks to Margaret Maron for directing me to your books. I do love my Southern family and love reading about others’ families especially with a mystery! Anna, You are the winner of my book and Loupe necklace giveaway. If you’ll send me your snail mail address I’ll get the package out to you soon. You can contact me direct at Bren.Witchger@gmail.com if you wish or leave the address in reply here. 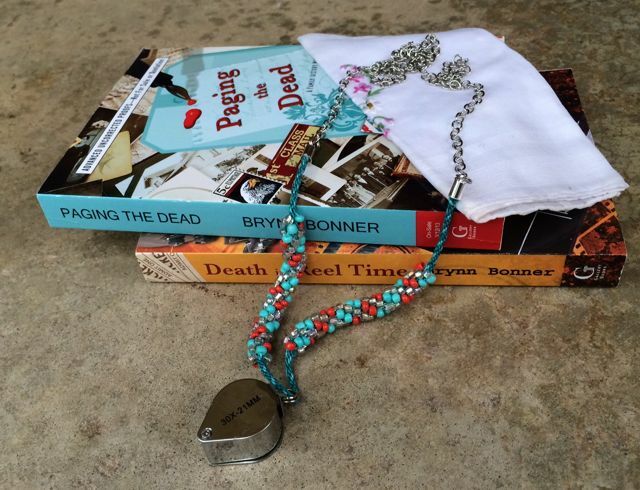 Hope you enjoy the books and necklace. I love the premise of your books, you are a new to me author, will be adding the series to my tbr list. Thanks for the din giveaway!!! I would love to read these books. Thank you for the chance. If Margaret Maron endorses you, count me in. And love the loupe. Enter me, plz. I would love to be entered for a chance to read your books. I am an amateur genealogist. It would be a pleasure to be introduced to your series. Please enter me for a chance on winning. My 10 yr old Grandson in interested in family history. The loupe would be helpful in our searches. Sounds like a fun [new to me] series. Besides, any author who is a friend of Margaret Maron’s is a favorite [new] friend of mine! I love it all. Thank you.for the chance. I have always wanted to research my family tree. I too found you via Margaret Maron – and is sounds like a great series. My sis in law and I were discussing family history today, in fact, and talking about a several generations ago cousin who’s birth & death record she found and then couldn’t find again… so frustrating. But we’ll find it! Mysteries and genealogy….a great combination! I would love to win this gift pack. Margaret Maron sent me to this page! It’s gotta be good! If MM recommended you…can’t wait to read!! Ms Maron recommended you and I’m very intrigued…. Plus I’m a newbie to genealogy too! I love the idea of this series and can’t wait to dive into it! We are chasing some family genealogy right now so this is perfect! I’ve been an amateur genealogist and a mystery reader for years but never knew about your series. I will be looking for the books, even if I don’t win them….though probably through the library! I heard about your books on Margaret Maron’s FB page. Love mysteries and genealogy. I saw Margaret Maron’s post about this on Facebook. I love family history and would love this package! I heard about this lovely giveaway on Margaret Maron’s FB page. I love genealogy and mysteries; glad I found this series through Margaret! Look forward to reading them. Would love to start with these two books! Thanks for the opportunity! Good luck with your fourth book! Got the post through Margaret Maron’s website, but I have read the first of your books. will look for more as I am a rabid genealogist. Southern and trained by the Great Aunts to get all the once removed, connections to distant ancestors and to tell their stories. Have family letter that go back to 1840 and have learned to read the handwriting. Would love to win this giveaway. Just found my baby scrapbook dated febuary1935- Mach 1936.I’m seeing pictures I’ve never seen before of my Washington D.C. family and my mom wrote on the back of each photo.This is making me cry. I’m working on my native American grandfather on my mom’s side Piece by piece. I would really enjoy reading your books. Family history is so complex and fun to work on. My family is English and Irish. We’ve discovered a lot of information on the Irish side. but the English side is baffling! I do genealogy, but have never read your series. I’d love to. Thanks. This sounds sooooo intriguing! Would love to learn more about all of your books! Interesting! Family history can be incredibly interesting, shocking, complex, and everything in between. I’m intrigued by the idea of books that combine two of my favorite things, genealogy and mysteries Thanks for the chance! This looks like the tye of book I would love to read! I am nrew to your books, but I love the two subjects together, mystery and genealogy, sounds so awesome!!! Shout out to Margaret Maron, found this via her FB post! Love your books and am looking forward to the newest one. So excited to read we can have an opportunity to get 2 of your books and tools to continue with our family history. My parents started down the road to learn about our families’ past and I have continued the journey. Now, I am encouraging my nephew and am thrilled to have another member along for the ride. History and mystery…great reads…always – true or not. Thanks! I just stopped by, after seeing Margaret Maron’s post! Congratulations on your newest title! I.enjoy your books very much and am eagerly awaiting the new one! I would be thrilled to the moon to receive such an awesome gift! Thank you for allowing us to try! Just saw Margaret Maron’s post on Facebook and now you are on my reading list! I’d be more than happy to add a new writer to my list and two books to my to-be-read stack! Thanks to Margaret Maron, I now know about your series. What a gift it would be to receive your books. Thanks so much for the opportunity! What a fun giveaway celebration. Your books sound delightful! Thank you for the opportunity. I have been working on our family tree for over 10 years. Ancestry.com has helped a great deal. Just heard about your books now and would love to receive the first two. I am going to order your latest. I often thought that the information we gather about our ancestors is probably just a hint of the stories that we wish they could tell us. Loved the first three can’t wait to read this one! I love reading mystery novels and especially a series. Look forward to reading these. Sounds great, would love to win these prizes!